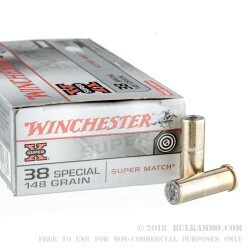 An ideal round for range training and match shooting, the Super-X .38 Special Super Match rounds are designed with paper punching in mind. 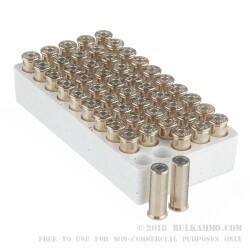 Loaded with 148-grain flat headed wadcutter projectiles, these rounds leave perfectly circular holes that can be easily seen for scoring or sight adjustment. At a muzzle velocity of 710 FPS, these rounds offer less recoil than a traditional .38 special and are a great round for practicing with your favorite revolver. 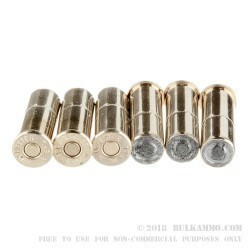 Loaded into boxer-primed, noncorrosive, reloadable brass cases, these rounds do not have jacketed lead cores and may be unsafe for use in some indoor ranges. 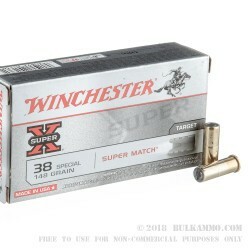 Each box of Winchester Super-X wadcutter contains 50 rounds. First produced in 1922, Super-X has delivered dependable performance for generations with their no-frills approach to quality ammunition at an affordable price. For 150 years, the name Winchester has been a model for American quality, reliability and ingenuity. Using only the highest quality components and cutting-edge manufacturing processes, Winchester produces some of the world’s best ammunition and some of the most recognizable firearms ever made.